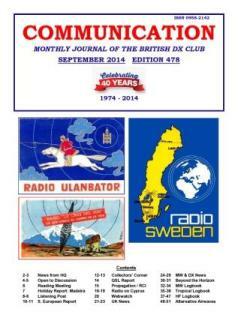 Welcome to the British DX Club (BDXC-UK) Web site. This page contains information about the club and its services. For articles and other radio-related reference information please see our Articles Index Page. Updated April 2019 for A19 schedules. Latest HF Propagation Column on right is a key to the A and K indices. You may have to refresh this page to see the latest data. Full information about the club. Click here for current subscription rates and how to join . BDXC's guide to international broadcasts in English on short and medium wave. Radio Stations in the United Kingdom & Ireland. BDXC's guide to all UK and Irish MW and FM radio stations. Advice and information on Power Line Technology and other forms of SW interference. The club runs BDXC-News at Groups.io for circulating the latest news and information to members. A recent sample of our monthly bulletin "Communication" which is available as a printed booklet sent by post or in pdf format sent via email. Contact information for club officials. Notes and printable forms for use when contributing to logbook and QSL columns in the magazine. Click for the best of the Web for broadcast DXers.